I am so glad you found my blog. Your work is so special, and I look forward to reading through your posts, and seeing more of it. I'm in my element in this post! Leonardo Drew continues to intrigue and I look forward to following all the links. I never heard about lance letscher and leonardo drew, but I am sure, I love their works. In german I would say: "seelenverwandt"! I don't find an english word for this - perhaps someone else knows a translation! thanks for this post - I feel inspired! 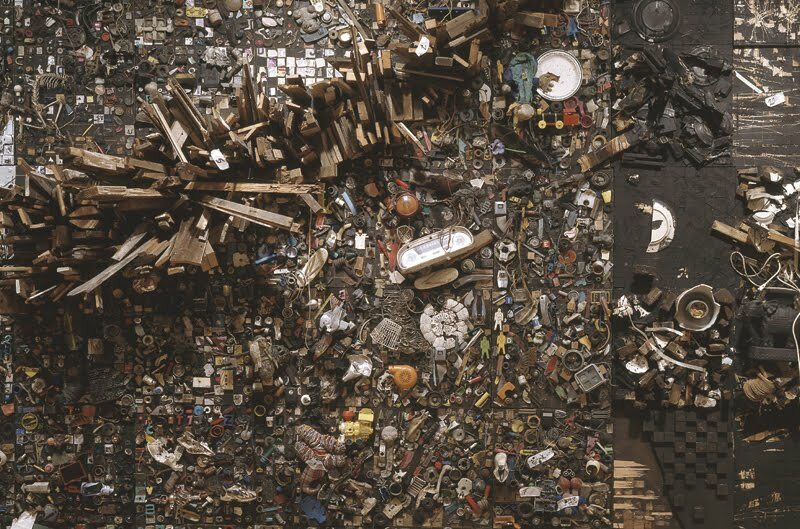 Louise Nevelson was an important pioneer in this area. She struggled for nearly 50 years for recognition, which (thankfully) was eventually achieved. these artists are new to me. 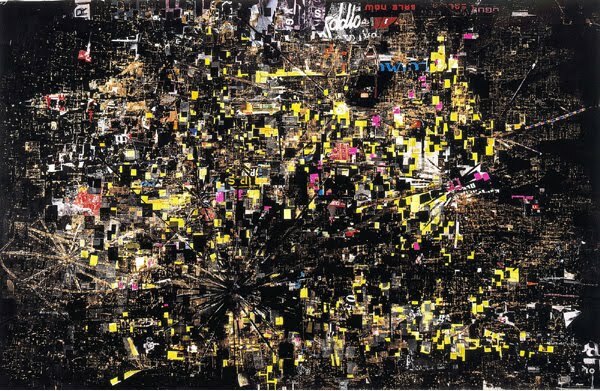 I think Mark Bradford's piece appeals to me the most. reminds me of life and especially the human spirit. Building layers, little pieces, different colours, lines like arteries - the activity in the centre is for me an analogy of a person's core, the heart of one's spirit/soul. Intriguing. What an interesting group of artists! dont you wish you could see inside their minds and learn what got them started in this direction! what is it that makes us all gather certain things as if to keep them from disappearing? thanks so much for introducing me to this group of hunters and gatherers. Thanks for sharing these artists Donna, they are new to me and I wonder how their lives must be so inward focused to be able to build up so much material into the larger works. Fascinating. These artists are new to me as well, thanks for posting. 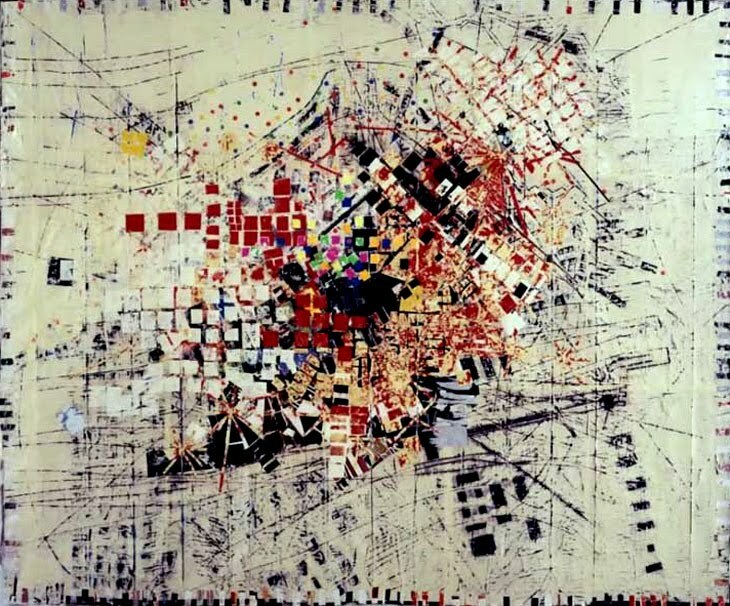 I am finding myself drawn to Mark Bradford's work. The intricate process is amazing. 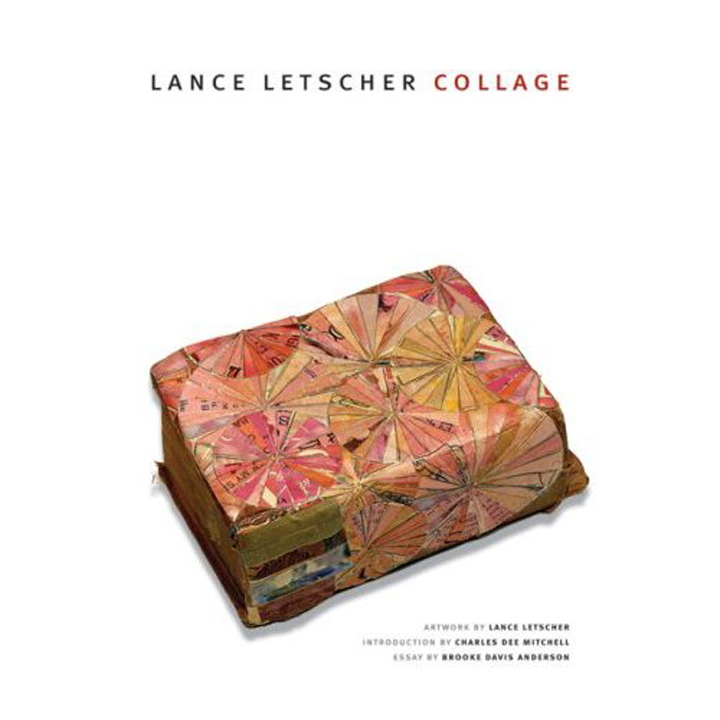 Thanks so much for introducing me to Lance Letscher. I've seen bits and pieces of his work around but I've never connected the name. 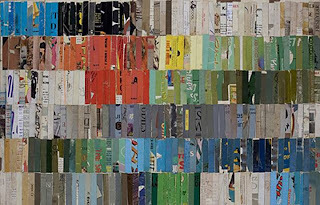 His work is great and I've ordered the Collage book. 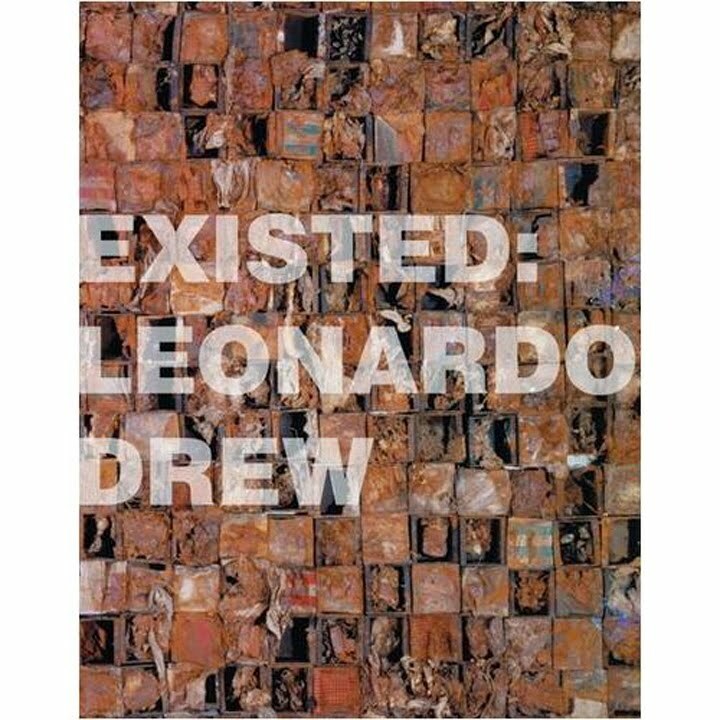 I already have the Drew book and find it fascinating. Happy collecting! oh I think obsessive is quite a good word to describe it and do not feel it is derogatory in any way, rather it creates the feeling that the art takes over and demands the completion of such intricate detail. just remarkable post Donna as always! wonderful, wonderful. (oops, i feel like lawrence welk suddenly.) inspiring, fascinating work you have found. thanks so much for posting. love your work -- i'm so glad we have made acquaintance. will you ever do any workshops east of the mississippi? encore en vacances..je me réjouis de regarder tout ça! Its interesting isn't it how one word (obsession) might have a negative connotation and (tenacity) a strong positive quality. And therein lies the power of words! It is also my experience that every quality that we view as negative has a positive flip side. I used to say that my mother was very stubborn, the flip side of that was perseverance. Great batch of new to me artist. 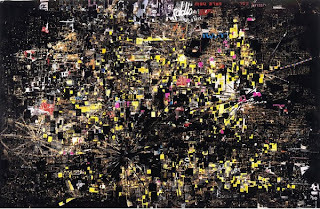 Especially love Mark Bradford's work. Thanks for another inspiring, thought provoking post. What a thrilling collection of art and artists. I think I feel an art book or two coming my way. Now, I need to go off and think about obsession and tenacity. i love the artists you have shared here, and thank you! 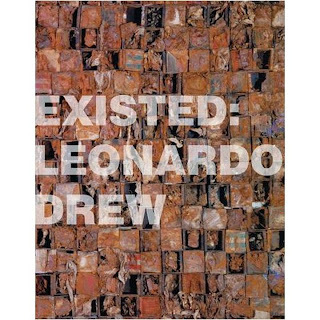 i am particularly drawn to leonardo's work as i am "obsessed" with boxes, caked rust and found objects. i will definitely be checking his book out. i love large scale art like theirs and one day would love to have the space to meticulously work on something so grand. how fun that would be! What a wonderful collection of obsessions you have here, Donna! And thanks for leaving a comment on my blog...I totally agree with you! 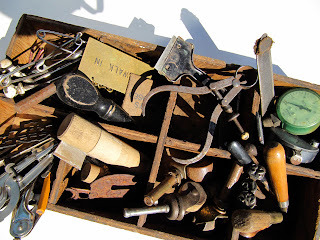 Oh, and this post of yours is timely for me as I have just borrowed from my local library, Lynne Perrella's book on collections and obsessions. This is one post that has truly spoken to my heart and my eye as well, (love the photos & artists you present). Perserverance trumps obsession in my book! It is really about the integrity of remaining true to a body of work that is slow to manifest, but worth the wait. 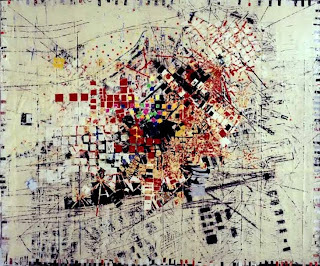 "What we need more of is slow art, art that grows out of modes of perception and making." Robert Hughes. I have been contemplating that sentiment for some time now & you seem to have nailed it! Thank you for introducing us to these two artists, Drew and Letscher--I often think of perseverance (as Marie above said) but also tolerance-as an essential part of the art making process. Tolerance for the ebb and flow of ideas, patience, energy, and fresh inspiration. Robert Hughes' quote about art growing slowly out of perception and making is so accurate. 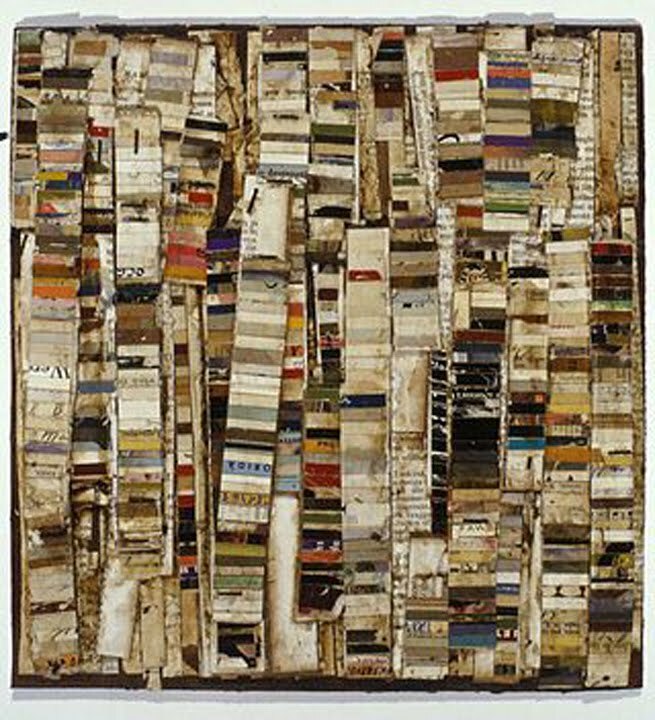 Are you familiar with the work of el anatsui, the Nigerian artist? i can not imagine this kind of "tenacity", a well-chosen descriptor...it does "blow my mind" too, even via the photos: to stand in front of one of these=wow! An over used word amazing but these photos are amazing. I will be back later to take the tour...I'm shaking my head and saying 'amazing'! I have to admire the dediction it takes to prepare and collate so many diffent pieces! The amount of 'bits' that go into one large piece is quite mind boggling. I often only work with 5 or 6! years ago when looking for a house to buy I went into an old wreck of a place, huge, and many of the walls were "wallpapered" with hundreds of tiny pieces of paper which made a crazy quilt upon the walls. I was in awe. This was not an offical artist who did this, I assume, but someone whiling away the very long and cold winter hours. I probably would use the word obsession to describe the process of gluing or whatever so many small objects into one whole, however I looked it up too and it is more of a psychological dysfunction as presented in literal definition. 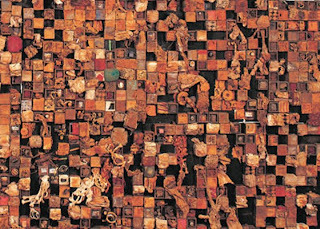 i am quite fascinated by these works you have shown and also I have always been fascinated by what I consider "obsession" which is a primary focus on doing something (art, wriiting, music, scientific explorations etc) to the elimination often of daily tasks and the usual things that the "ordinary"person focuses on. Writers who write a lot fall into this category for me. Beethoven, Mozart. Einstein. The absent minded professor's of the arts and sciences. you've made me really love collage. I've just signed in for a workshop on collage. Inspiration comes from so many different places. Thanks for the new info and links. 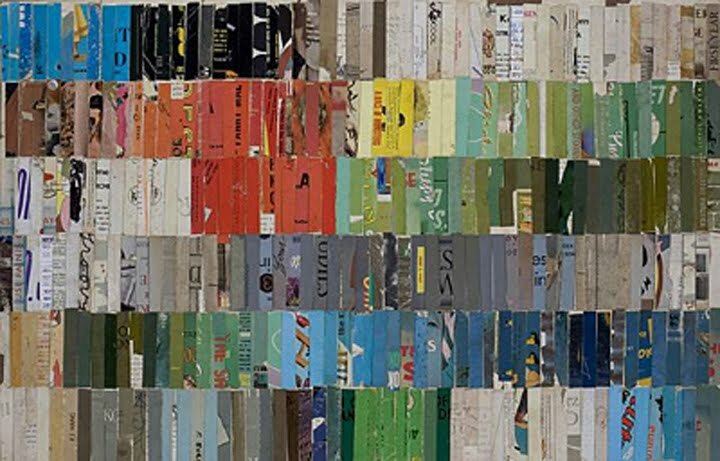 Recycled "anything" to be used in artwork is indeed a plus. Thank you for this introduction to several artists that I knew nothing of. One thing struck me in particular and that is the value of the repetition of a motif, several of the artists you have shown make good use of this. There was a program on UK TV last night about Andy Warhol and the same thing occurred - one image of a can of soup dose not mean much but repeated many times and it has real impact. This relationship of the micro and the macro has many analogues in the world, as some have pointed out here. The whole is greater than the sum of the parts. 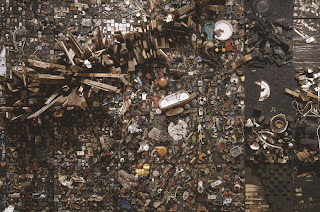 In the photography world, Chris Jordan (www.chrisjordan.com) has made a name for himself by photographing large numbers of small objects as a commentary on mass consumerism in our world. 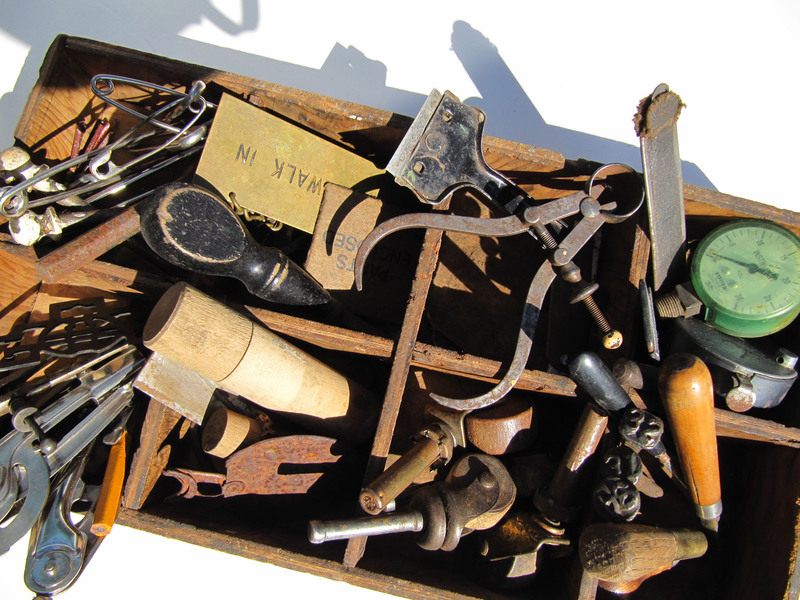 Many of us are collectors of things. I think it was wonderful that he made art with his collection. Maybe I could do the same with all of my "stuff". Possibly I would feel better about it and it would say something positive about my "obsessions". I like "the profound human urge in the face of life's transience to leave a trace, to state "I was here." Legacy again. We were here. Thanks Donna for another great post. Thanks for sharing these wonderful images. I'm not sure if these artists are obsessive, or just more dedicated to the implementation of their vision. Perseverance? Persistence? Hmmmm..... whatever it is, it's amazing! Loving looking at your work! i would say meticulous drive for order making; it could be in another culture a form of mandala making, of matching some inner pattern of the psyche with an outer meditation tool (not psychosis but active silencing of what the world is so over ripe with in chaos and waste). have been transfixed and changed by my Horiuchi; thanks for the introduction. Its full of grace. Donna, the Fromm quote you chose to "sum up" this post is appropriate. I thank you for introducing me to these "obsessive" artists. 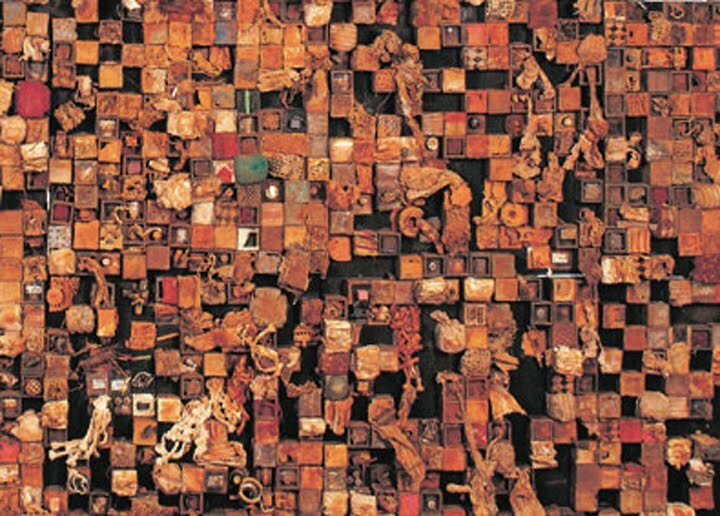 The intricacy of their collective vision is dazzling. And by "collective," I mean the way each has the vision to collect and reassemble into something bigger. And the way in which their works, taken together, enlarge one another. Amazing artists! I really enjoyed seeing their work. Thanks for sharing. I think we are all obsessed one way or another but these artists have found a way to capture it and make it physical. Another good post! You are amazing, and I love your clever and lovely comment by the way. Thank you. I am obsessed myself, and it is comforting to see other obsessions, but more than that i love your analysis of art, and i apply or try to apply many of your suggestions to myself..your previous post for example, in the hope of finding out 'who I am' it is a trying but fun journey for me , and I wanted to say thank you to you for your help so freely given . Fascinating, love the concept of leaving a trace. Thanks for the tip. perhaps "attentive", "focused", "lovingly detailed", could describe what you are drawn to in the works of these artists? A knowing that each tiny element is precious and integral to the whole...metaphor for how we treat ourselves, the people we love, the people we meet, those we never meet but have compassion for nonetheless, the way we walk and care for this earth we all share. I don't know, but that's what comes to mind for me. Attention to detail beyond belief, just beautiful. Thank you for sharing these works. i like that map ...interestingly i find the obsessive thing sometimes tiring for my mind. sometimes i think that if one puts together enough of anything it will look fantastic which is very cool but i'm personally torn between being attracted to minimalism and 'clean' 'uncluttered' over mass stimulation. i get it though and admire people who have that kind of vision! Wow- each and every piece is fascinating- with so much energy and content within their spaces. I love the patterns formed with the gradations of color and tones among similar shapes. Each and every photo is mesmerizing. Thanks so much for putting all of these artists' works and sites together. They are all new to me- but won't be for long!